Campus. Clinic. Connection… the uncommon blend that gives biomedical research an edge at Vanderbilt. Located in the renowned School of Medicine, adjacent to a leading medical center, providing access to a trans-institutional research network and cutting-edge patient care, it is our responsibility to leverage this unique structure to improve human health. VU319 is an example of how we bridge bench to bedside. A drug candidate developed by a team of Vanderbilt scientists, it could treat both Alzheimer’s disease and schizophrenia. It is now in patient trials at Vanderbilt University Medical Center, but the foundational research from which it developed began more than a decade ago—the average timeframe from discovery to trial. 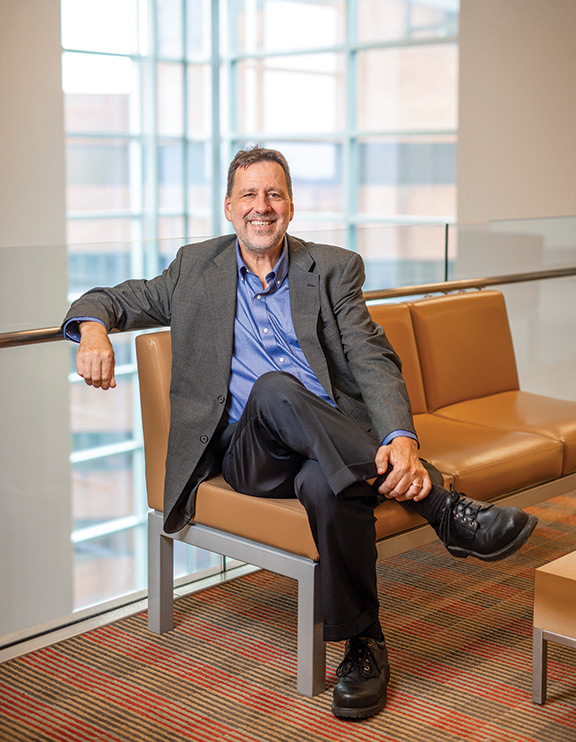 For Jeff Conn, Lee Limbird Professor of Pharmacology, a passion for neuroscience began as a teen when he witnessed a close friend develop schizophrenia. His journey brought him to Vanderbilt—as a student and again as a researcher—where he now leads the Center for Neuroscience Drug Discovery. In 2017 his decades of research produced a potential new treatment for schizophrenia expected to work for some patients who have shown no response to existing medications. Leveraging our culture of collaboration, he hopes to identify other conditions this medication could potentially treat, expanding the impact of both the drug and his work. in biomedical and biological sciences in the U.S. In any academic department endowed chairs are critical to recruiting and retaining the very best faculty, but in the field of biomedical research, it is even more imperative. As our faculty become better known and achieve hallmarks in their careers, they become subject to recruitment by other universities and industries. Endowed chairs support our ability to keep and recruit leading researchers, as well as maintain the synergies created by a consistent network of pioneers. With investment in our people, we strengthen our ability to generate, disseminate and apply knowledge, and train the next generation of scientists. Our students are innovators of the future—doctoral candidates who will spend their lives on the frontiers of innovation—and we must equip them with tools to launch successful careers. We provide comprehensive career development services through the ASPIRE program (short for Augmenting Scholar Preparation and Integration with Research-Related Endeavors). ASPIRE showcases the variety of careers available, from academic and industry research to medical science advocacy to government and administration. Efforts include our Annual Career Symposium, where approximately 300 students benefit from insight and advice from dozens of speakers and alumni. At the forefront of graduate professional career development, we became one of only 17 institutions nationwide to receive an NIH BEST award recognizing bold and innovative approaches to career empowerment. However, ongoing funding is needed to continue to provide these valuable services to our trainees. Every major advance in clinical medicine starts with fundamental discoveries that teach us how living organisms function in health and disease. Charitable support for biomedical research will produce one of the best available returns of any investment opportunity. These contributions leave a legacy of impact through the generation of ideas and discoveries. As part of a major research university with access to nationally ranked clinical treatment centers, the infrastructure is already here. Your funding completely supports the science, rather than the development of a framework to just get a project off the ground. With existing resources and capabilities, we can quickly launch research leading to treatments of the future. The award-winning Engineering and Science Building is a hub for interdisciplinary learning and innovation. With state-of-the-art capabilities, three floors of the facility are designated for faculty at the intersection of biomedical science and engineering. Funding to name these areas will support new research and produce discoveries with the potential to prevent and treat diseases and illnesses, and save lives. Planned gifts, including bequests and life income gifts, help you meet your financial and charitable goals while supporting groundbreaking scientific discovery in the long term. We are honored to carry forward the legacies of those who wish to further critical research and enhance patient care for generations, such as Nashville philanthropist and Vanderbilt benefactor Louise B. McGavock, whose estate gifts currently support faculty members, research and students. For more information about how you can join us in strengthening biomedical research at Vanderbilt in our next 150 years, please contact (615) 875-1760 or BasicSciencesGiving@vanderbilt.edu.